Manipur, from its early period, has its own unique features in different cultural aspects. Among the cultural aspects of Manipur, the traditional practice of medical treatment for various diseases may be mentioned. From various texts and other literary works which are related with this subject, we can understand that the traditional practice for treatment of various kinds of diseases is a very old practice in Manipur. 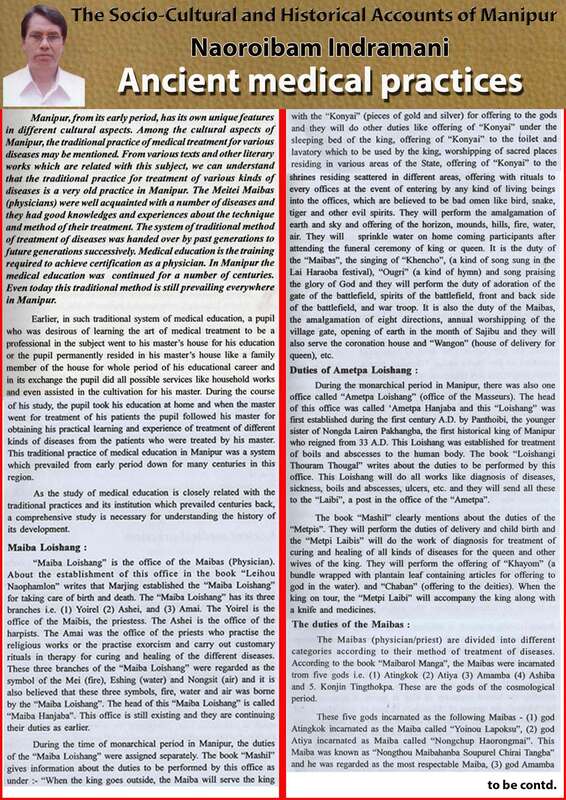 The Meitei Maibas (physicians) were well acquainted with a number of diseases and they had good knowledges and experiences about the technique and method of their treatment. The System of traditional method of treatment of diseases was handed over by past generations to future generations successively. Medical education is the training required to achieve certification as a physician. In Manipur the medical education was continued for a number of centuries. Even today this traditional method still prevailing everywhere in Manipur. Earlier, in such traditional system of medical education, a pupil who was desirous of learning the art of medical treatment to be a professional in the subject went to his master’s house for his education or the pupil permanently resided in his master’s house like a family member of the house for whole period of his educational career and in its exchange the pupil did all possible services like household works and even assisted in the cultivation for his master. During the course.